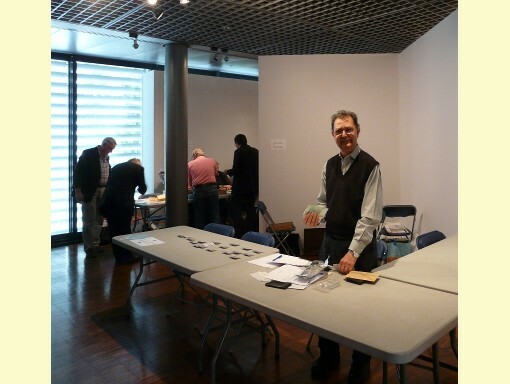 The 2012 Convention of the International Playing-Card Society had taken place in Issy les Moulineaux, near Paris, France, from Friday 14th September to Monday 17th September. 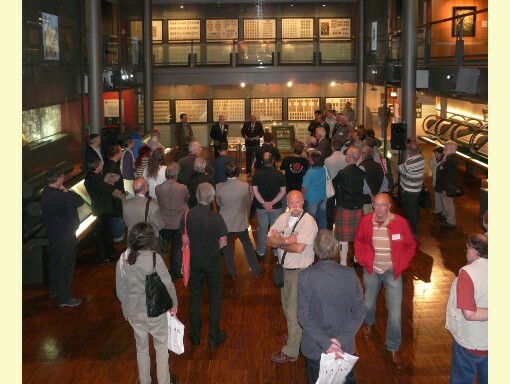 After the convention of 1998 and 2006, the French team (ACCART) had gain a lot of experience and managed to propose a very professional convention. With the help of the Museum (musée français de la carte à jouer), the city of Issy les Moulineaux, Face&Dos and the national school of art (École Nationale Supérieure des Beaux-Arts), the price has been very reasonable and, as expected, many people came. We were busy from Friday evening to Monday morning with enough free time to visit some part of Paris (like the flea market) and meet friends. On Friday evening, we all received the convention paper, a catalogue, a bibliography "Les lois du jeu" by Thierry Depaulis which covers French rule books until 1850, a pack of cards "Via Vitae" by Face&Dos, 10 metro tickets (valid for the bus, tram and underground), a map and some more leaflets. 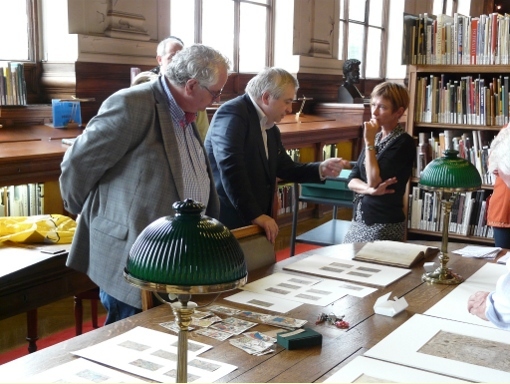 After the trading session, we were all welcomed by André Santini, the mayor of Issy les Moulineaux, who opened a special exhibition on new acquisitions. Fourteen items have been selected by Agnès Barbier from old playing cards to modern paintings. All of them are in the 24 pages catalogue with all details and colour photographies. 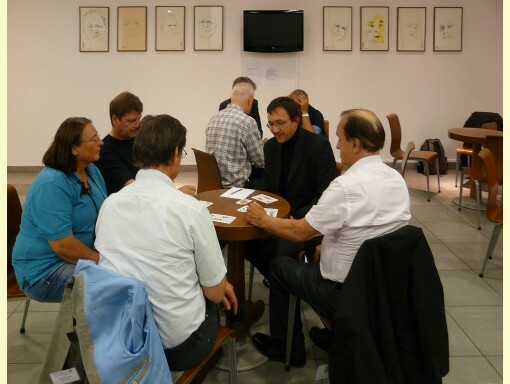 After a nice cocktail in the museum, some of us went to the cafeteria of the auditorium (Espace Icare) to play Coinche (or Belote coinché), a popular French game for 4 players, using 32 cards and related to the Jass family. The rules have been given to us in French by Gwenael Beucher and in English by John McLeod. On Saturday, we had a second trading session. It was quieter but new projects were presented like a tarot by Otto Spalinger. In the afternoon, we had five talks. After that, we had the convention dinner in Paris (thus the metro tickets) in a nice restaurant. The menu card reminded us that this was the 40th years of IPCS. And we had the surprise to find a pack of cards given by Pascal Pette from Face&Dos. On Sunday, we had three more talks. Monday was reserved for the happy few who booked long time in advance. 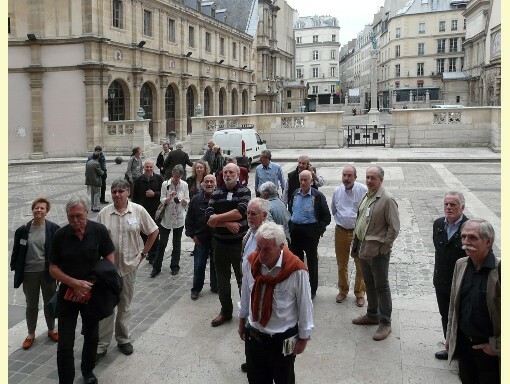 The library of the Ecole Nationale SupÃ©rieure des Beaux-Arts is small and only two groups of 25 people were allowed. While one group was looking at old cards from their collection, the other one got a guided tour in the school. A catalogue were given to us and like the British library the school had started digitalising its collection. This page is maintained by Christian de Ryck and John McLeod (ipcs@pagat.com).